On Monday morning, May 12, I sat in the backseat of a Toyota Corolla, headed to Chibok. With a satin abaya draping my body in a sheath of black, and my hair curled underneath a black chiffon hijab, my careful effort to blend into northeastern Nigeria’s conservative, predominately Muslim society appeared to be working. The soldiers who peered into the backseat gave me casual glances, waving us past checkpoint after checkpoint. 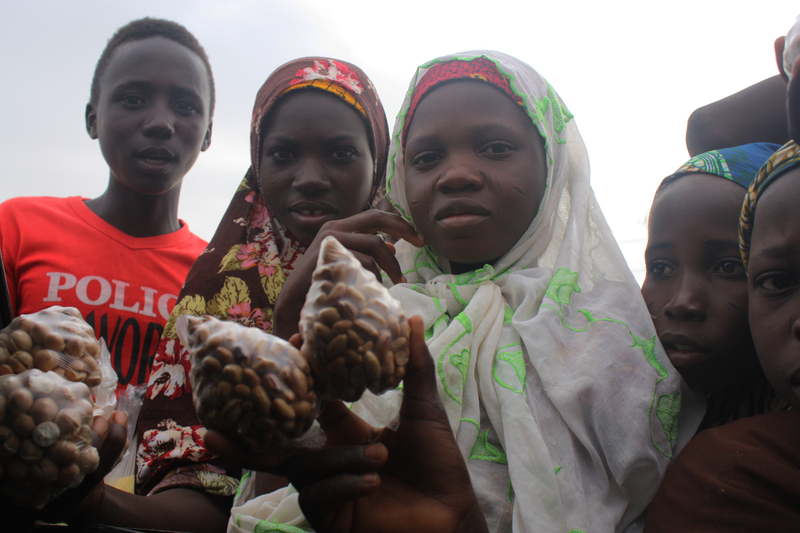 When I set out for Chibok—a three-day journey from the Nigerian capital of Abuja—I’d encountered children selling peanuts and sachets of water along the road. Those who had nothing to sell simply held out their palms. “Allah ya kiyaye, Allah ya kiyaye,” they’d said, muttering prayers in the Hausa language for Allah to grant us a safe journey. I’d been warned about the dangers of the trip: Boko Haram hide in the bushes along the road to Chibok, waiting for lonely cars to pass by. They cross the street to get from one end of the surrounding fields to the other, and they shoot at cars as they go, before disappearing into the Sambisa Forest. “From this point of the journey, everything from here is Sambisa,” explained one of my companions, Daniel Wadai, a lawyer and Chibok native I’d met in Abuja at one of the daily #BringBackOurGirls rallies. From the passenger’s seat, he gestured to the left, just above our driver’s head. I turned to look and saw small bushes stuck in the sand and a few scattered trees. I had expected to see a dense grove of trees. “This is not a forest,” I said. “No. It’s not the forest that the media is painting it to be,” Wadai replied. Dogonyaro, acacia, and baobab trees flashed by in a blur, as the Sahelian landscape grew drier and flatter. Yellow flowers broke the monotony of the green and brown landscape. And then, suddenly, we were surrounded by cows making their way across the road. One of them stopped by my window. I looked into its big, moist eyes, admiring its shiny, reddish brown coat. Our driver continued on undaunted, carefully weaving the car through the horde. A battered blue station wagon drove up alongside us, and its driver said something to us in Hausa before speeding away. For people here grappling with a palpable fear of fighters with no clear agenda and no set targets on their path of destruction, Boko Haram had taken on supernatural qualities. The group had completely wiped out villages like Bulabulin. There, weeds grew freely in farm plots. Cooking pots lay overturned in the dirt. On our way to Chibok, I counted three telecom masts, but I couldn’t pick up a network signal on my phone. Boko Haram had destroyed the area’s infrastructure, too. We soon reached the town of Damboa, where a battalion headquarters stood next to the abandoned construction site of a housing development. At the checkpoint there, sunburned guys who appeared to be in their twenties—all civilians who had volunteered as vigilantes—clenched guns, machetes, and bows and arrows. “Chibok, Maiduguri,” the driver answered. Damboa had once been a hotspot for Boko Haram recruitment, explained a stringer for an international news agency who was traveling with us, and whom I’ll call “Dayo.” Now, many of the boys there, having renounced their membership in the militant group, were trying to rid the town of Boko Haram. Monday is market day in Damboa, and the town was bustling. Vegetable sellers congregated along the roadside. A butcher sliced meat on a wooden plank as women waited for his cuts. Lean dogs scurried about. Men stood languidly in line in the heat, as civilian fighters inspected the men’s fingers for trigger marks—signs of heavy gun usage that could out them as Boko Haram members. 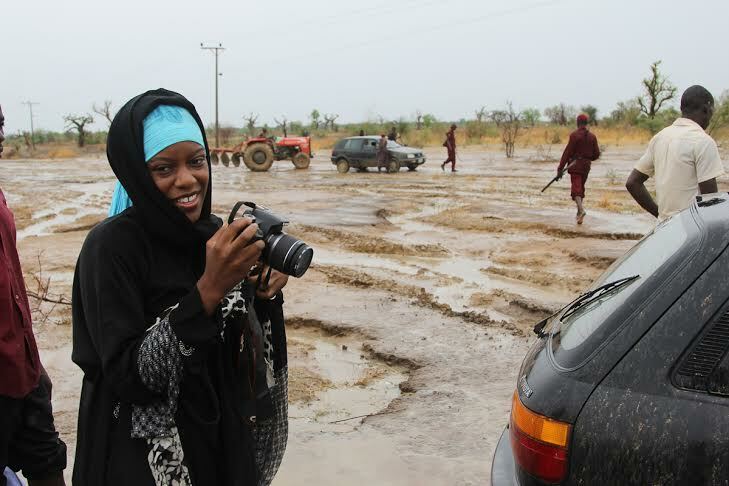 We left Damboa, turning onto a pothole-ridden dirt path known as Chibok road. Here, I came closer to Sambisa than I had ever been before. Now there were no checkpoints in sight. We had clearly embarked on the most dangerous leg of the journey. And then our car came to a halt. “Yes, all of this is Sambisa,” Wadai answered. Both of them left the car and stood next to the driver. I stayed inside, watching the bushes vigilantly. Five long minutes passed, and we were still stuck. Finally, the engine sputtered back to life and we drove on, deeper into a landscape devoid of villages and people. We rode silently, looking out the windows for any sign of danger. Civilian fighters inspected the men’s fingers for trigger marks that could out them as Boko Haram members. “Are those people running?” Dayo asked, alarmed. I saw the outlines of two people making their way along the edges of Sambisa. “No,” Wadai said, pointing out that they were biking. At 15 minutes before noon, the car stalled once more. The fuel pump was busted, Dayo and Wadai concluded. We let the engine cool down before starting it again, which worked—until it didn’t. 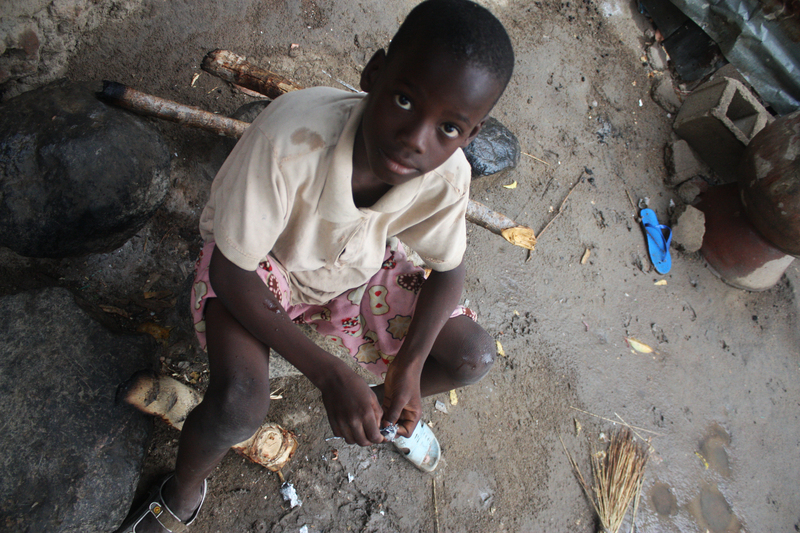 When the car stopped for a third time, we headed back to Damboa and found a mechanic. Leaving the car with the driver, we hired someone who agreed to take us to Chibok. The going rate was 3,000 Nigerian naira ($18). We arrived in Chibok covered head to toe in sand from one of the village’s fierce sandstorms. Amid the dust, a sign for the government-run secondary school marked the site of Boko Haram mass kidnapping. A guard let us through the school’s gate without much fuss, and we made our way across the rubble through a series of burned-out classrooms. Nearby, three people were sitting under a mango tree surrounded by charred debris: the school’s principal, Asabe Kwambura, and two administrators, who were waiting for a government delegation to arrive and investigate the incident. Kwambura greeted me, lifting her purple veil and wiping tears from her eyes. She projected confidence, though I sensed it was withering. “They are our girls,” she told me. I asked if the Nigerian military had been protecting the school on the night of the attack. Kwambura said no—the school had its own watchmen, and one had been guarding the main gate while the other was posted at the girls’ residence. I was stunned. A government school in a state under emergency rule had been left with no government-authorized security. Young girls had been sleeping in their rooms without any solid assurance of safety. Two matrons led us to the girls’ residence, where I saw bare bed frames and shards of glass on the floor. 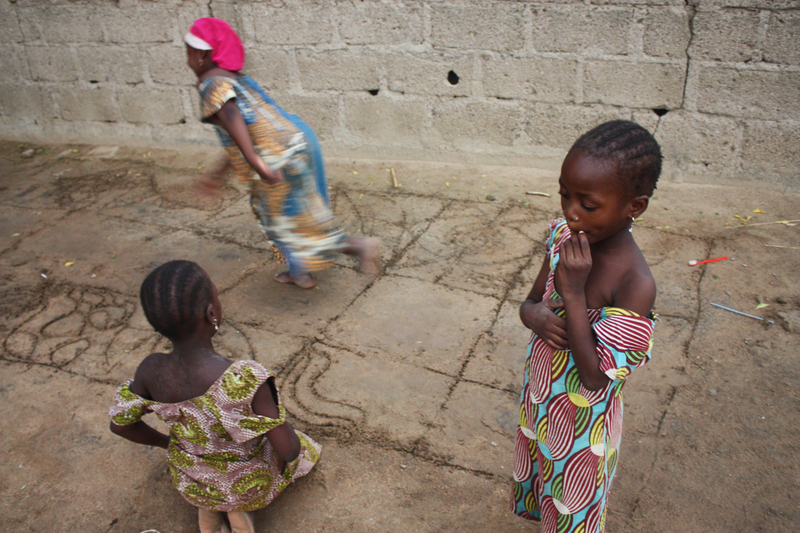 Standing in the bedrooms, I imagined the girls’ screams as they were snatched away. I pictured them disappearing with their kidnappers into the night. Outside, on the patio, I met Dorcas’s younger sister, Happy, who was carrying pails of fresh rainwater. Happy was angry. 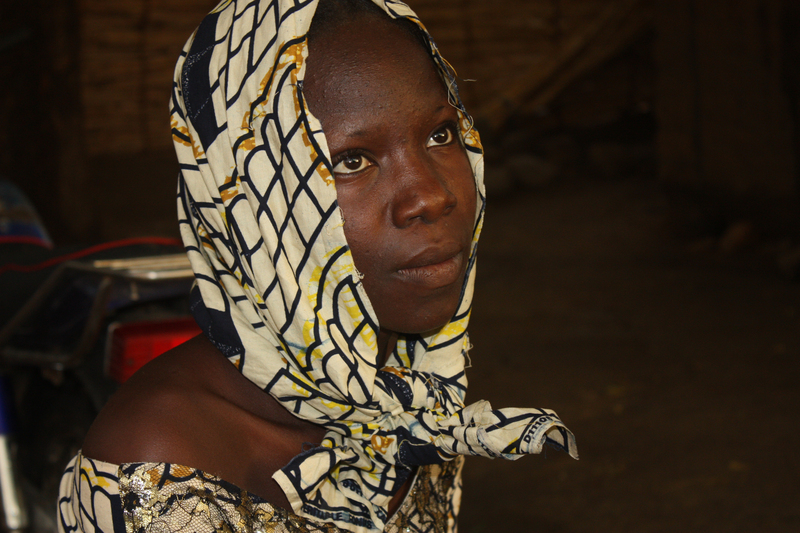 “I want to leave [Nigeria] because they are not taking care of us,” she told me. Residents here cannot feel the impact of the federal government’s estimated $5 billion defense budget. On my way to the home of Lawan Zanna—whose daughter, 18-year-old Aisha, had been kidnapped by Boko Haram—I met a gang of giggling girls jumping in shapes they had drawn in the sand. It looked like a game of hopscotch. Wadai told me it was called elgalagala. The girls jumped and twirled and laughed with glee. I stopped to take pictures and they posed like fashion models. At Zanna’s home, I sat cross-legged on a red straw mat on the patio as he told me how he and the other parents had marched through Sambisa in a fruitless search for their daughters. Hawa, 19, showed me the bedroom she shared with Aisha. A large bed took up more than half of the room; plastic suitcases and laundry baskets were piled along the walls.In a low voice, Hawa described Aisha. “My junior sister has respect,” she said. “She is a very quiet girl.”Back on the patio, Zanna, was on his knees, praying to Allah. I said my goodbyes, and left the family to mourn.My last stop that day was at Lydia Pogu’s family compound. Lydia had managed to run away from her abductors after the attack in April. Sitting with Dayo and me on a wooden bench, she described how Boko Haram fighters had stormed the school asking for food and dragging the girls onto trucks. With a friend, Lydia had jumped out of her truck and landed on her stomach, before fleeing the scene. She told me she never wants to go to school again. She wants to farm the land instead. Some of the girls escaped by jumping out of the trucks. Others hid in the bushes or clung to tree branches. By this point, our driver had returned from the mechanic’s shop in Damboa, and he drove us to Wadai’s family home in Chibok, where we’d be spending the night. I sunk onto a couch, weighed down by sadness. I thought about the principal and her gutted school; about Lydia and her harrowing escape; about Happy’s bitterness, Marvelous’s hope, and Esther’s continuous tears. 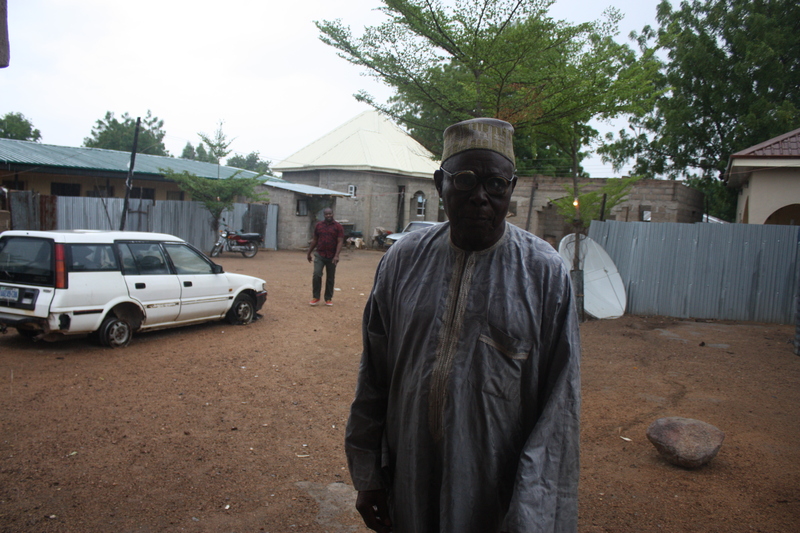 The next morning, we left Chibok, but not before stopping at the home of the oldest man in the village, Bitrus Dawa Kulaha Abugar Woshanta Umar Ibn Elkanemi, or Bitrus Dawa for short. He tells everyone he was born in 1910. We spoke about the first time he saw white people—Christian missionaries—in Chibok, in 1923; about the 1967-1970 Nigerian civil war, when he was working as a teacher; about how corrupt, unethical Nigerian leaders had degraded the country. Raindrops interrupted our conversation. “That dirt road is impossible in the rain,” Wadai told me, urging me to wrap things up with Dawa. I ducked into the car, where Dayo was already waiting. The driver snaked through the mud until the car stalled—yet again. Dayo yelled in frustration and the driver silently opened his door. With his pants folded up to his knees, he began to walk around aimlessly. We stayed there for almost 10 minutes, until Wadai took the wheel and nudged the car out of the mud. 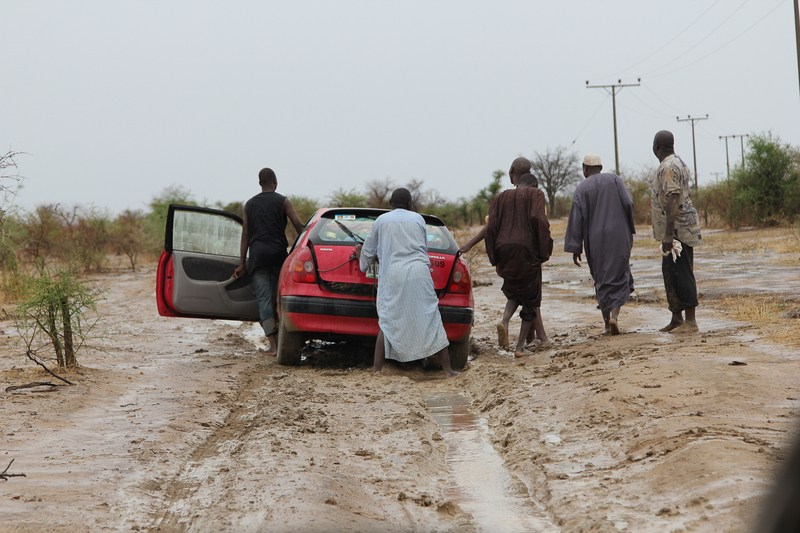 Chibok guys pushing a car out of the mud on a rainy morning. We came across a group of cars that were also stuck, and I recognized Lawan Zanna and Esther Yakubu’s husband, who burst into smiles when they saw me. They were transporting Lydia and four other girls who had escaped from Boko Haram to Maiduguri at the request of the government, in the hopes that the girls could identify abducted classmates who had appeared in a video released by the militant group.Some of the girls in the car had, like Lydia, jumped out of the trucks, while others had hidden in the bushes or clung to tree branches as the vehicles drove off. “We are not happy until our friends come back,” Lydia said.We helped the other cars out of the mud and proceeded on the road together in a convoy. Eventually, we reached the first major checkpoint.A soldier asked us where we were going, and where we were coming from. Me, Chika Oduah, on a rainy day on Chibok Road.